In addition to being a wonderful opportunity to network with fellow businesses and professionals, The Big Lunch is an ideal event at which to entertain prospects, existing clients or teams. 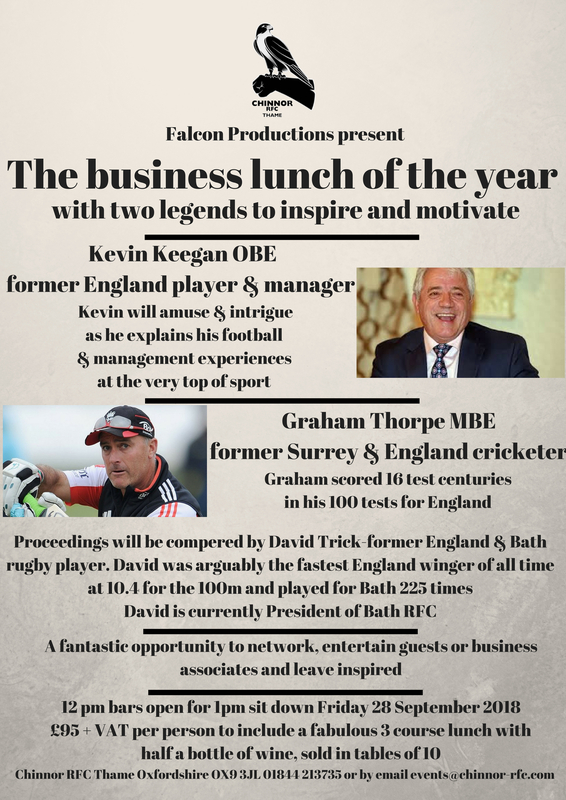 Headlining a marvellous list of speakers is Liverpool and footballing legend Kevin Keegan OBE . With his crazy hair styles and fantastic football, Kevin is never without something to talk about in his after dinner speeches. Kevin started out playing for the town of Scunthorpe and got his lucky break with Liverpool under Bill Shankly. Kevin has been both England Player of the Year and European Player of the Year. He is also one of the very few players who has both captained for and managed England. After an impressive football career and taking the managerial position at both Newcastle and England, Kevin retired from management. "Kevin was the total professional, we have had many ex footballers in the past. But he is in a league of his own. His presentation skills had humour and interesting,facts and was tailored specifically for the audience. I can not recommend him highly enough." Kevin was a fantastic speaker, and more importantly a fantastic bloke - he was extremely professional and worked with the club on the night to help raise as much money as possible. The feedback from the audience was all positive, and he took time out to speak to everyone.. He was the best speaker we have had to date, and i would not hesitate to recommend him..
Kevin Keegan was the best we have ever had our members have all said the same. A quote from the FSOA would be. How do you follow that? Kevin Keegan was a star on the pitch and is now a star on stage.We would recommend Kevin to anyone and would at some point ask him to return for us. Graham Thorpe MBE British born cricket speaker and player began taking part in the sport at a young age, a natural right hander he trained himself to play with his left hand aged just six to stop his older brothers from bowling him out during their childhood games. Growing up to join both the Surrey and England cricket teams Thorpe played professionally for almost twenty years. Our compere for The Big Lunch is David Trick, David represented England at every level, from under-16's through to International. He joined Bath in 1978 whilst still at school and played almost three hundred games, scoring 191 tries. David also briefly ventured into athletics and was the National Junior 100m sprint Champion with a best time of 10.4 seconds. After this brief encounter, David decided that he was a rugby man at heart.